Just Jingle: It's a Newton's Nook Anniversary Celebration! Hello, folks! I am so excited to be participating in the Newton's Nook 2nd Anniversary Celebration Blog Hop Today! Huge thanks to Newton's Nook for providing a stamp set for this post! Also... you are going to LOVE this stamp set, dude. For reals, though! Be sure to read this entire post to find out how you can win a gift certificate, too! I did a little no line coloring using Spectrum Noir markers and some ink blending for the calm waters. and the sun. This sentiment CRACKS ME UP. For reals, though. LOVE! There is a LOT of fun going on for this anniversary celebration! Check out the inspiration along the blog hop and enter to win AWESOME prizes, too! You can find all of the details on the Newton's Nook Designs Blog! Would you like to win a $20 Store Credit to spend at Newton's Nook Designs online shop? Comment on the Design Team Member and Guest blogs (see list below)! One lucky winner will be chosen at random from the collective blogs in the blog hop. Make sure to check out each of the blogs and comment for your chance to win. You will not know which blog has been chosen so the more you comment on the better your chances are of winning! You have until Sunday, July 19th at 9 pm CST to comment -- winners will be announced on the blog post on Monday, July 20th. They are running a giveaway on the Newton's Nook Facebook page too so make sure to enter there for another chance to win!! Here is the complete hop list! Be sure to check out each blog! lol Free shark hugs? Hmm... Such a cute card! That sentiment is awesome, right?! Super cute - love your no-line coloring! Yaay! Jingle's back! We love you Girl! Cute card! Hahaha! Thanks for the chuckle!! So fun! Love that shark's face! No hugs thank you!! Love the expression on that sharks face. Totally adorable!! Troy and I totally just laughed. So cute! ha...so fun! He looks like he wants to give a very BIG hug! great design. Fun sentiment for this shark card. I like your no line coloring. 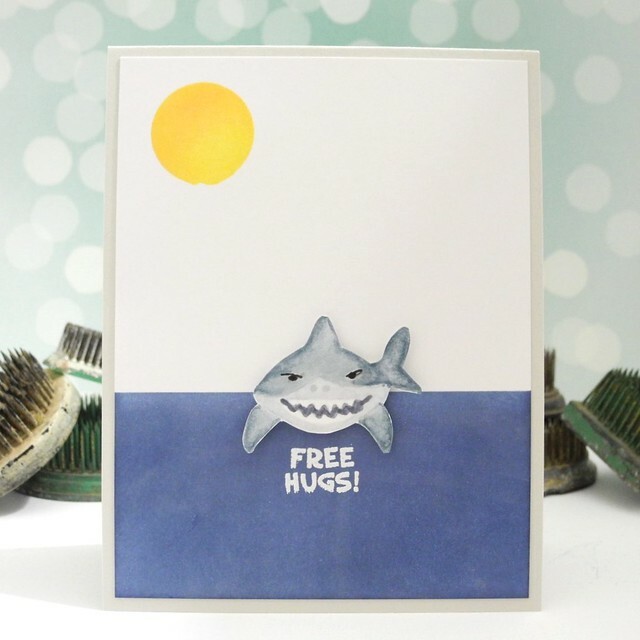 Not sure I would want a shark hug (free or not) but your card is cute and funny--good sense of humor. Cute and funny shark card...but no hugs. Oh that gave me a chuckle...fun card. Love this card! So funny!! The best cards always make you laugh. haha...did you hear me chuckling?! Love this. I'll pass on the shark hugs even from your friendly shark, but I like the card a lot. love the card, would look great with say cheese under it too! This is such a fun card! I love the no line coloring you did and the fun simple sunset! Thanks so much for playing along with our 2 year blog hop today!! Love the shark on this card!! What a funny card...love it! Super fun card, love the sentiment! TFS! So cute! Love the expression of the shark face! I love your coloring on the shark! I've never seen no-line coloring before - that's a really cool technique! your card is stunner!!! I love it! so simple but what an awesome design! Awesome card and I love that shark. TFS. Cute card...it will bring a quick smile to someone! Love this card! So funny! This is supercool, I can hear the music from the film Jaws :) Have a wonderful weekend, sweetie! This shark is the coolest! Free hugs, shouldn't we all give at least one once a day? Fintastic! Hehehe, your card is so fun! I love this shark stamp set! I hope it comes back in stock soon! Love your no line coloring! What a fun stamp set and card! cute card! reminds me of the shark in the movie finding nemo! Love the card. The sentiment is so darn funny. Thanks for sharing. Jennifer, it's so nice to see someone using spectrum noir markers instead of copics for a change! Great card! Cute card. 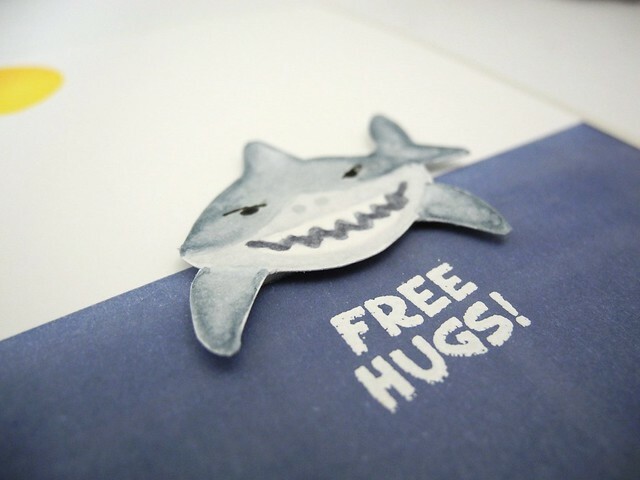 But sharks here on the coast have not been so nice with free hugs.... only free attacks here. OMG! My husband would love this card! Very cute!